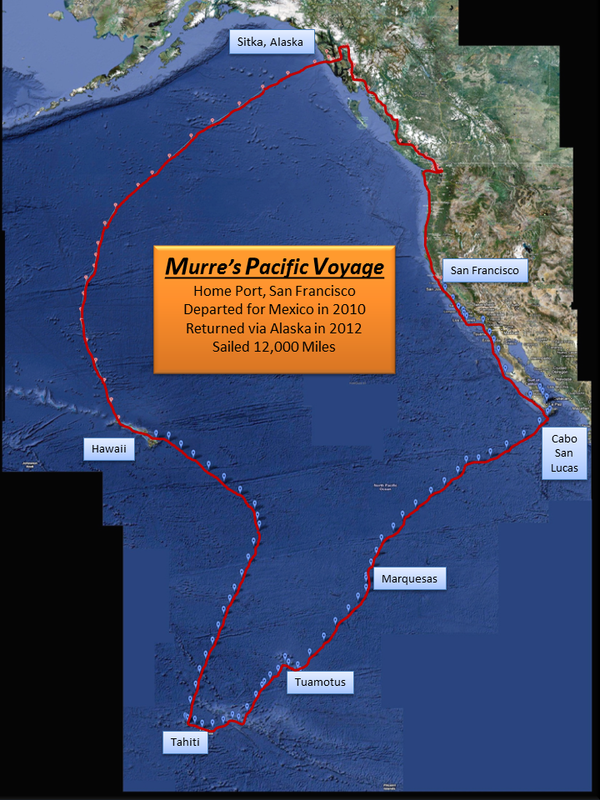 Murre and the Pacific chronicles a two-year solo cruise of the biggest ocean on the planet. While in Baja, many sailors I met talked of their spring migrations to the Marquesas. The where? A little research put these islands in French Polynesia, enticing close to Tahiti. Tahiti! What sailor could resist that exotic call? Not this one. I practiced my pitch for days prior to a weekend visit from the wife in Cabo. One evening by the pool and in the company of two margaritas I began the broach. “I’ve been thinking of visiting the Marquesas before the leap to Hawaii,” I said. “How long will that take?” she asked. She pondered for a moment. Which from an infinity of justifiable objections would she choose? Had I anticipated them all? “I think you should do that,” she said. In total this now two-year exploration of the Pacific entailed visits to many of the islands and atolls in all three groups of French Polynesia, all the main islands of Hawaii, and Alaska’s Inside Passage from Sitka and the Sawyer Glacier all the way to Seattle, all solo and in a small boat. One unique feature of the story is its thoroughness. In particular, ocean passages were logged to this site daily, and reportage went far beyond the usual (position, wind, waves) by attempting to share in article-length detail what it is like, what it feels like, to cast one’s fortune with the sea. Alas, the organization of a blog is not that of a book, and so for those wishing to navigate the content themselves, a CHAPTERS category has been added to the right sidebar, which contains eight Episodes in blessedly correct chronology. The reader will quickly notice that none of the posts from sea contain pictures, this due to a communications system whose low bandwidth disallowed graphical files (except once). Pictures were taken by the score, however, and were posted to the blog later and organized by episode in the PHOTOS tab. The last leg from Hawaii to Alaska was captured in eleven VIDEOS produced roughly every other day while on passage. Lastly, the story doesn’t end with Murre’s return to San Francisco in 2012. To learn about the next adventure, please visit The Figure 8 Voyage.